Now that police in New Zealand are going door-to-door to confiscate firearms, which involves bird-dogging people at work and monitoring their online activity, one man who has gotten caught up in the covfefe was recently stripped of his airsoft BB guns and his crossbow. You may within three months after the date of this Notice or such longer period as the Commissioner of Police may allow, sell or otherwise dispose of any airgun or antique firearm owned by you to a person approved for this purpose by a member of the Police. 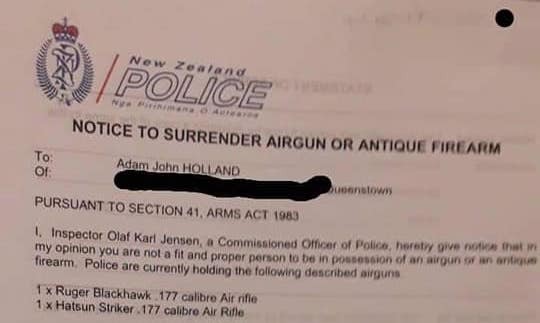 Failing that, all airguns or antique firearms delivered to a member of the Police may be detained for such a period as the Commissioner of Police thinks fit, or may, in the discretion of the Minister of Police, become the property of the Crown, free and discharged from all right, title or interest possess in respect thereof by any person. You may by way of origination application, appeal to a District Court Judge against this Notice. (Section 62, Arms Act 1983 refers). 1. I do not believe you to be a fit and proper person to be in possession of an airgun. 2. Police hold serious concerns regarding your mental and emotional wellbeing. Should you wish me to review my decision or you dispute the facts you may make written submissions or arrange an appointment with me within two weeks of the date of this notice. Any submissions you do make must be accompanied by a letter from a medical practitioner attesting to your mental and emotional wellbeing at this time. The reason for all of this? According to another follow-up, posted on April 6th, it’s because Holland is a Trump supporter.